I’ve been trying to incorporate more essential oils into my daily life. There are so many amazing, creative ways to make them a part of your routine! I regularly oil-pull with a peppermint essential oil & coconut oil blend, and I use a tea tree & coconut oil blend every night to moisturize and cleanse my face. But I have bunch of bright, spring scents left over from my (ill-fated) idea to make homemade candles for my wedding that I needed to put to good use! Pro-tip: don’t try to make 50 homemade essential oil/ soy candles as wedding favors—planning a wedding is stressful enough! 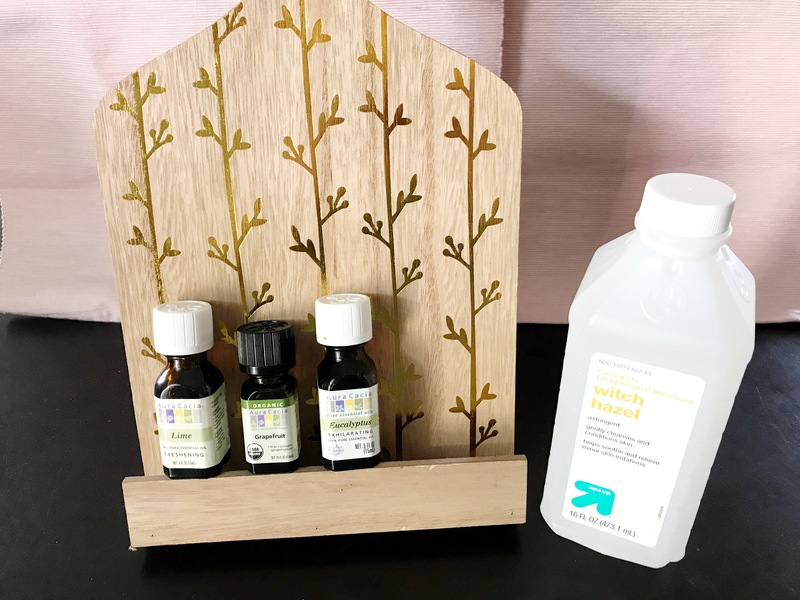 After I saw this post last year, I was inspired to make my own linen spray with the lovely scents I had just lying around in my cabinets. But, after an incident involving me lifting this plant mister by the plunger, breaking the mister and spilling oily water all over my bedroom, I briefly set aside my goal of perpetually gorgeous-smelling sheets and pillows. Well, no more! 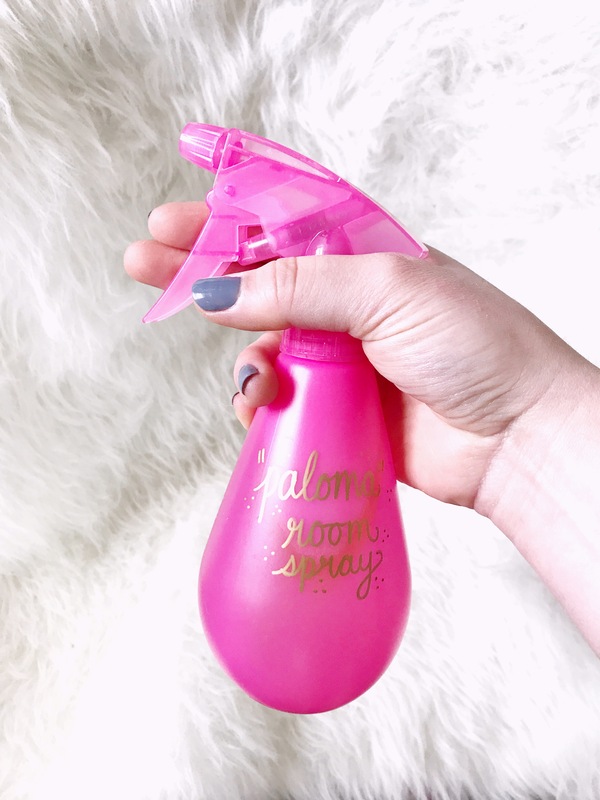 I was helping a friend shop for an upcoming trip yesterday, and in the travel section of Target I found a cute little pink spray bottle, which reminded me of this awesome DIY! I can’t take any credit for the idea or the basic recipe, but the essential oil blend is something I concocted, based on the amazing cocktail, the Paloma! The Paloma is a tequila-based cocktail with grapefruit and lime—delicious, refreshing, and reminiscent of warm summer nights. I’d found my muse. Combine 1 part water to one part witch hazel in the small spray bottle of your choosing. My witch hazel has a slight odor, so next time I make this, I’ll use more water than witch hazel. In a 12 oz bottle I used about 30 drops grapefruit, 20 drops eucalyptus, 20 drops lime. How strong you want your scent to be is up to you! Give the bottle a shake and spritz anywhere that needs freshening! * I added a handwritten label with gold Sharpie—paint pens or chalk pens will also do the trick! *The oil and water will separate, so shake the bottle before each use for best results. The grapefruit is bright and refreshing, the lime is fruity and mellow, and the eucalyptus adds an almost minty sharpness reminiscent of the fragrance of tequila. All the cocktail love with none of the calories. Happy spring, happy Passover, and happy Easter! Oh, and blanket apology for the title pun. 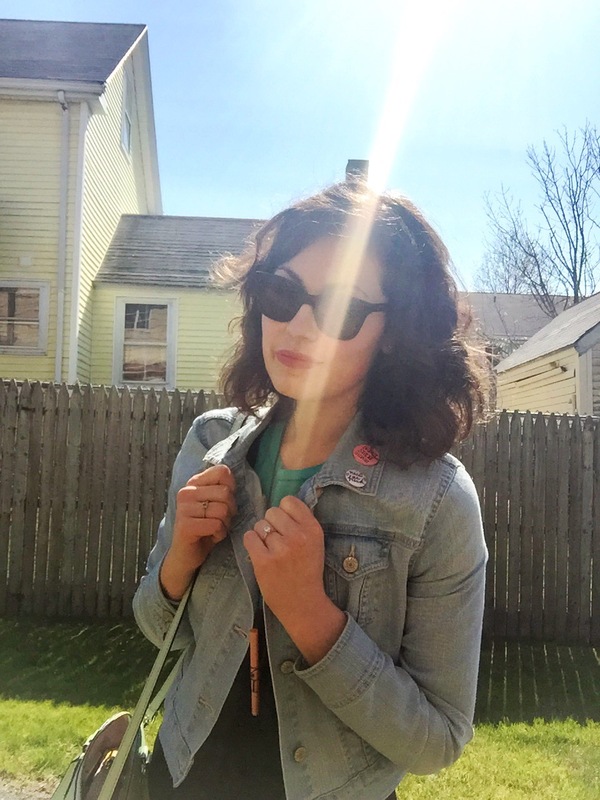 So, guys—I did a DIY and it did NOT turn out horribly! I recently bought my first record player (yes, at age 24, shut up). I only have 4 LPs so far (because of the Spending Fast), but they have such pretty artwork that I just needed to display them. 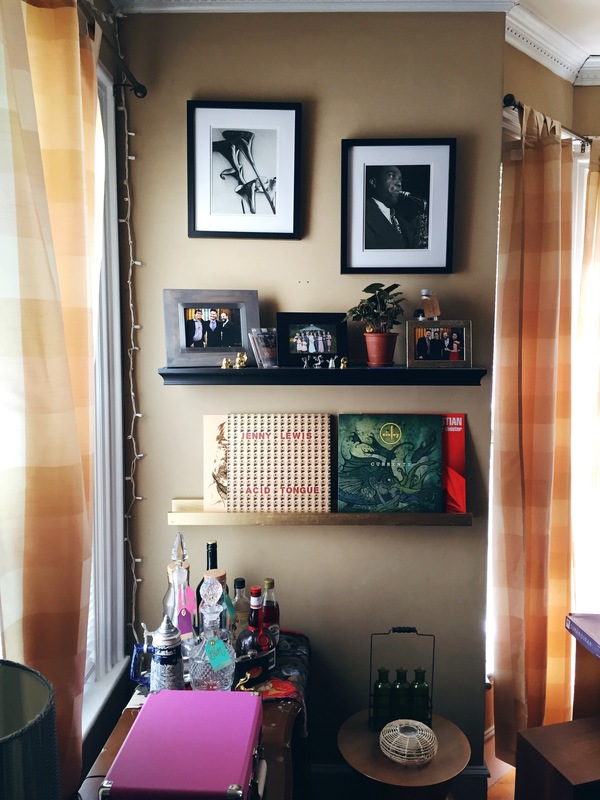 When I saw this Photo Ledge DIY on A Beautiful Mess, I knew I’d found just the thing. Since we redecorated our living room, there’s been an awkward patch of bare wall underneath our faux-mantlepiece that I’ve been dying to fill up with some art. 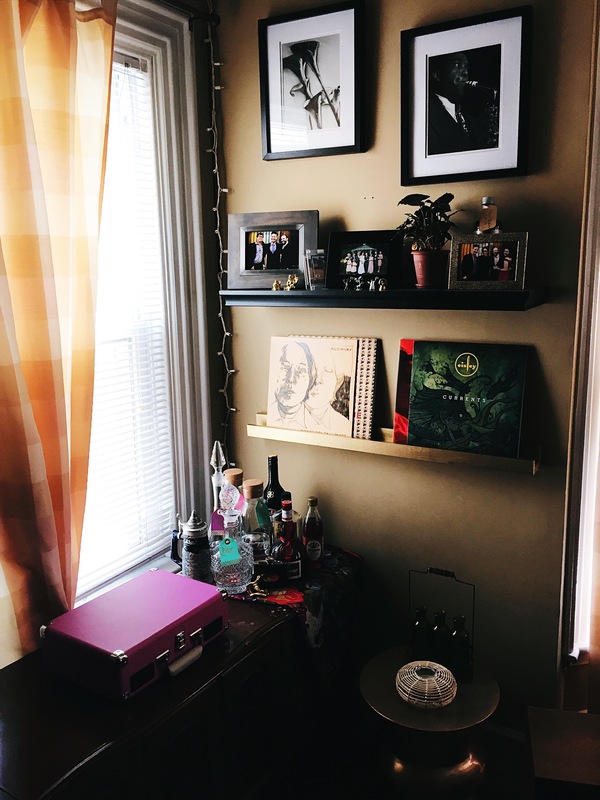 When I saw the DIY on ABM, I figured I could make the space work double duty as a place to store my tiny record collection. Of course, I messed up along the way. My power drill is from Ikea—I lovingly call it my “drill for girls.” Not having the right tools for the job was a major roadblock that turned this into a day-long, rather than an hour-long project. Also, Home Depot is a confounding labyrinth—we spent way too long searching for supplies. But all in all, I’m proud that I made something useful with my own two hands. After I assembled the wood, I primed and painted the ledge gold, because all gold everything, obviously. I asked my father-in-law to come over with his drill to hang the shelf, et voilà—stylish record storage! I’m so inspired to work on more projects because of how successfully this one went. Can’t wait to share more DIYs! Today marks a somewhat historic day for me: I attended all of my classes, submitted a homework assignment on time, and am in really good shape to catch up with this semester’s work! I’m actually excited to write a law paper on Plato’s Apology of Socrates. I might actually. freaking. graduate. It’s getting so real. So, logically, rather than, y’know, study for Art History, I decided to clean the crap out of my apartment. It is amazing what accumulates in your fridge and freezer when you’re not paying attention…Let’s just say that, despite our super-green recycle-mania, we’ll have a full bag of trash this week. Some useful stuff, like organizing my office, happened. But some fun stuff happened too. When I moved into Fig’s place, his cabinets were *sorta* decorated with random glassware, and I managed to go almost 3 years without realizing that they are perfectly rainbow-colored! Elsie Larson of A Beautiful Mess has an incredible rainbow-colored glass collection that has been a total inspiration. It was so nice to be able to start my own with “found objects” (which is what I call all of Fig’s pre-Chelsea possessions, basically). Also, cleaning out your fridge and cabinets can be really inspiring…for cooking, that is. I invented a sauce that I kind of want to call “béchamelized”, but I don’t know that anyone would get it. Caramelized onions and cauliflower, white wine, butter, and parmesan cheese instead of flour. 2 legit 2 quit. I served it over pierogies and wilted spinach because LIFE IS AMAZING. When you have 3 full-time jobs (retail worker, 15-credit college student, & homemaker/housekeeper/adult-I-guess? ), there’s very little pure “me-time”, so getting to do some redecorating and creative cooking was so refreshing. P.S. I’m calling 3.18.16 the day I finally committed to Snapchat. I’m @highwaytochel over there. Story is fiiiiire right now. Also, here’s the Amazon link to buy the damn album. It’s kind of embarrassing that you don’t have it already. Phases for life! 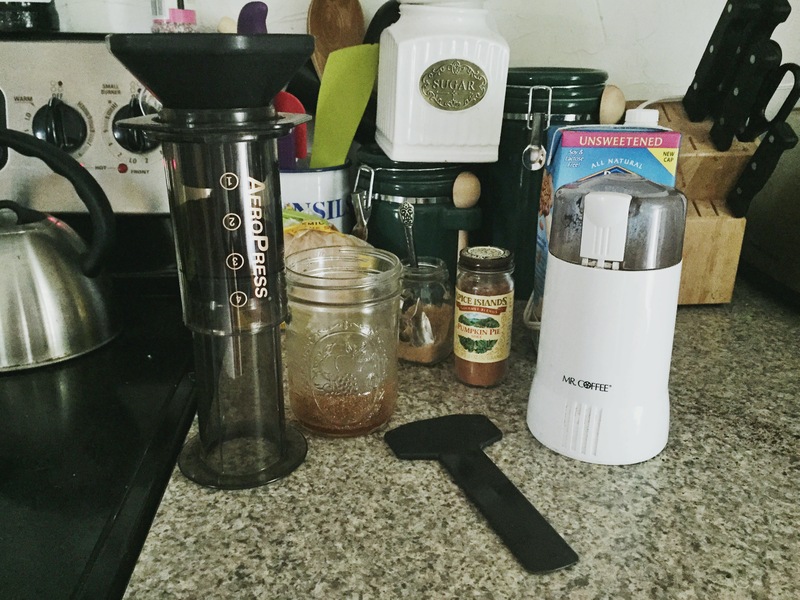 Easiest At-Home Pumpkin Spice Latte Ever! Fall is taking its sweet time arriving this year. Here we are, nearly mid-way through September, experiencing a veritable heat wave. Some schools actually let out the other day because without A.C., this humid heat can actually be dangerous. We don’t have A.C. I’m a survivor! Actual screenshot from Tuesday. I was in a tank-top and shorts and still nearly died of heat stroke. Since it is projected to cool down today, I wanted to celebrate with a pumpkin spice latte (also known as the siren song of all basic white girls). Pejoratives be damned, I love a pumpkin spice latte and will never be ashamed of it! They don’t typically contain pumpkin. This is fine: they are pumpkin spiced, which simply means that they are flavored with spices typically used to prepare pumpkin pies. Takeout PSLs are loaded with sugar, and certain syrups contain artificial ingredients and food dyes. Gross. PS syrups can also contain sweetened condensed milk or powdered dairy, which makes them far from vegan-friendly. So, PSLs, while being delicious, aren’t perfect. The great thing about our online Pinterest-y, DIY culture is that we can take our beloved (pricey) takeout and mimic it at home for a fraction of the cost and calories! Win! 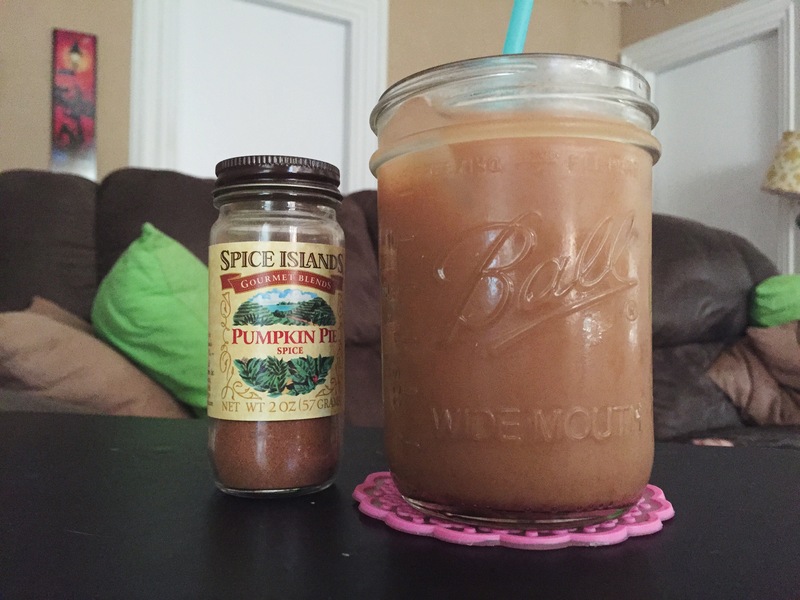 There are so many amazing PSL recipes online. Some involve homemade simple syrups, others actually provide directions to making homemade pumpkin spice almond milk! I was looking to create a drink that could be whipped up with no prep in those last three minutes before you have to leave the house for work. Plus, my at-home PSL can be made entirely without dairy or sweeteners! However, I’m no hero, so the recipe will have 2 suggestions for the sweet-toothed among us. Heat your kettle until boiling, and then set aside. The first step is personal: how sweet do you like your coffee? Some days I want to be kicked in the face with potency, other days I want something “wimpy” with the sweetness of melted ice cream. Place your desired amount of brown sugar or all-natural maple syrup into the bottom of your cup. Add two or three shakes of pumpkin pie spice (the flavor is surprisingly strong, so the amount you add is your personal preference). Next, add a tiny dab of hot water (more if using solid sugar, less for maple syrup) from the kettle, and stir until the consistency of your sweetener is syrupy. The pumpkin pie spice is a blend of cinnamon, ginger, nutmeg, allspice, mace, and cloves. So if you love flavored coffee but hate added sugar, you can just blend this with the hot espresso! Finally, milk! I actually add filtered water to my espresso, which technically qualifies this drink as an Americano, rather than a latte. I find lattes to be too milky and thick, and prefer a thinner, smoother beverage. For a hot latte, add your warm, frothy milk to the espresso and fill to the top. For an iced latte, fill your cup 1/2 to 2/3 of the way with milk, and finish with ice. For decadent presentation, especially with a hot latte, sprinkle some pumpkin pie spice on top and enjoy! 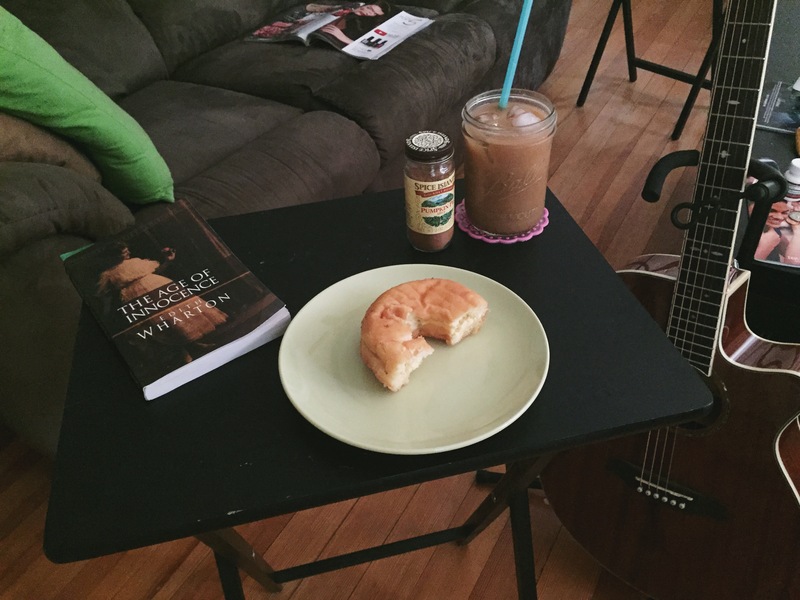 Tastes best with a doughnut, of course. This morning I’ll be enjoying my PSL with Edith Wharton. If you’re a pro at your espresso-brewing method, this whole process takes about 2 minutes, including grinding your beans. I usually put on my mascara while I heat my kettle—multitasking ftw! What’s your favorite fall drink? Products I Love: ABM x Agendas! So, like all 20-something girls with a pulse and a Pinterest, I’m obsessed with Elsie, Emma, and Laura over at A Beautiful Mess. I’ve made their recipes, done their DIYs, and gotten tons of inspiration from their books and site. My house is like a living tribute to ABM. It’s borderline sad. This actually looks like my desk at any given moment. I’m so excited to receive mine in the mail! When it arrives, I’ll probably do a product review. In the meantime, I’ll just have to keep writing myself notes on scrap paper and hoping for the best!